Today is a very special and exciting Saturday! A little over a month ago, Mandi and I issued the challenge that like-minded bead weavers join us in exploring the medium of Freeform Peyote. By it's very nature, freeform peyote is an abstract art form - no set pattern, no hard and fast rules. Instead; an open-ended canvas for creativity. Thirty six amazing women took us up on the challenge. 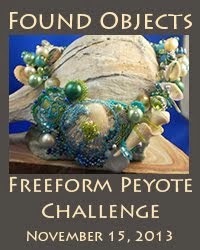 Today, it all comes together in the first Freeform Peyote Choose Your Own Adventure Challenge and Blog Hop. While I expect to see many amazing pieces, this challenge focuses as much on process as on completed projects and we've asked everyone to share their stories as well. Visiting the participants' blogs in preparation for today, I've been thrilled to see so many of you sharing just that, while holding back the final reveal for today. I can't wait to see everyone's work and read their 'travel journals'! I invite you to join me in exploring what they tried, what worked and what didn't, as each designer acts as a tour guide and forward explorer into the wilds of their creativity. Visually, the bracelet above and below has come a long ways from its ugly duckling stage. However, in terms of working time, I completed more than two thirds of the stitching in my first two posts. Between my previous post and here, I simply had to fill in the awkward gaps and keep moving colors until my beadwoven band roughly equaled the width of my stone focal. I added a small amount of top work, using over bridges very sparingly in the bracelet as I was already quite pleased with the color movement and shapes. I added the mother of pearl button last thing. It's larger than many of the buttons I use - large enough that it definitely acts as an alternate focal as well as the clasp. So that's my take on the challenge. Trying Your Hand at Freeform Peyote. If you've considered trying your hand at freeform peyote and would like to ease into the medium, hop on over to the Freeform Peyote Group on Facebook for a great support network and links to a number of great freeform peyote resources. And if you'd like a bracelet similar to Winter Blues, I am putting together two bead kits that will be available on my Etsy store sometime this weekend (I'm running a little behind). The kits will contain all of the beads that I used in my bracelet above (right now I only have enough of everything for two complete kits) as well as the most detailed photo notes I've ever taken regarding my process, including lots more photos than fit in the three blog posts. Karen, this is beautiful! Lovely browns and blues flowing so effortlessly. You are the fearless leader of this group and I thank you so very much for giving me what I needed to take the first step. I enjoyed participating in the challenge and plan to continue with future projects. Thank you so much for sharing your talents it has truly been inspiring! I soooooooo love how you've finished it! I really enjoyed your three part journey, and thank you so much for starting the group with Mandi, and hosting such a wonderful challenge. 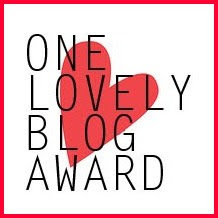 I had so much fun, and it's been very inspiring to visit the blogs this morning! You know how much I admire freeform and you are the one who convinced me that it is not a swear word. I am still not there but this hop has offered so many ideas! Thank you! 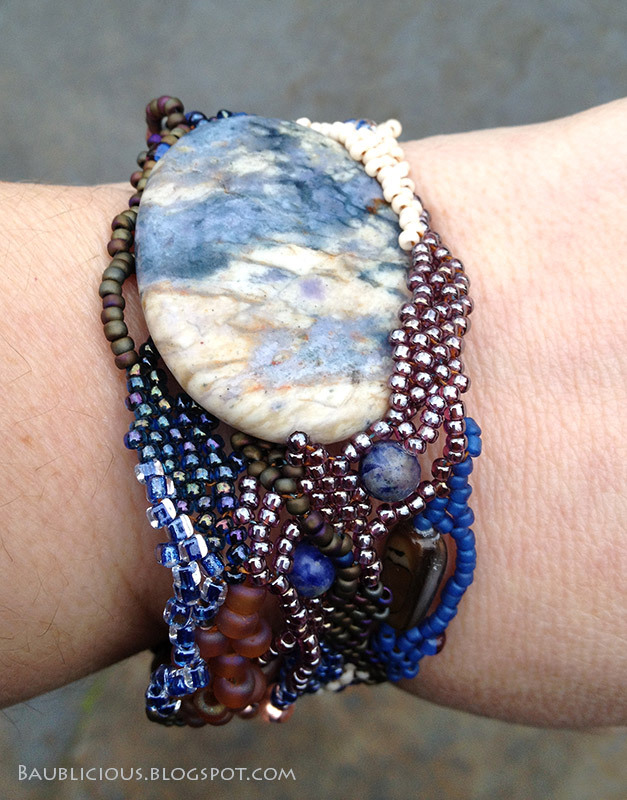 Karen your finished bracelet is beautiful and so rich with luscious colors. 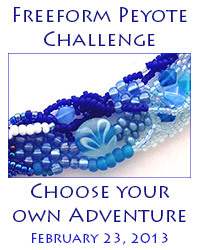 Thank you for hosting this challenge and for sharing so freely of your gift of bead work. Your work is amazing! Beautiful design Karen and I loved reading your thought processes as the creation evolved. This blog hop has been a fun-filled learning experience for me. Thank you to both you and Mandi for all your hard work hosting this event! 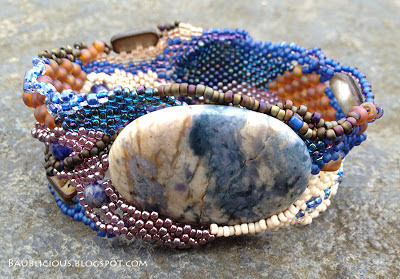 Seeing your process and your finished bracelet is just amazing; you really are the master of freeform!! This bracelet is stunning! it just looks and feels like nature with the colors flowing and blending. WOW!! I love that you made it a 3 part series so we can get behind the scenes and in your brain, hehe. You are a master at manipulating the different bead sizes! Lovely focal and a gorgeous piece as a result. It was my pleasure to co-host this challenge with you! The bracelet is beautiful. That focal is stunning. My first thought was that the focal was an island floating in the sea of beads, though I see the winter blues in it as well. I could get lost in the twists and turns of the beads. I love the way your bracelet turned out and I loved the journey. It was truly a learning experience for me. I had such a fun time with this challenge - I hope we have more. I am off to see the other's pieces. Thanks again for running the challenge. Karen, wow! 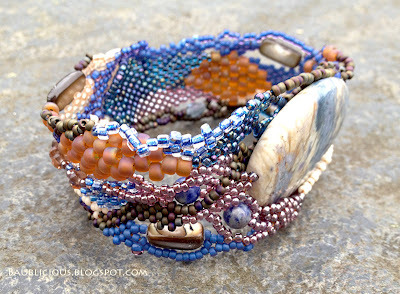 I love your bracelet, and I love that you did an instructional series on it and turned it into a kit. You took the challenge to another, completely awesome level! I loved seeing this from beginning to end! Well done. Beautiful! 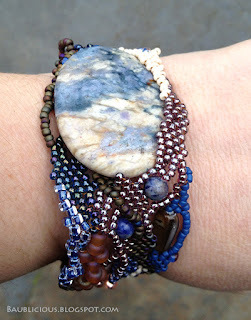 I love the earthy and elegant look of your bracelet. There is just something so classy about blues, browns, and creams together. Thanks you for hosting this challenge and I'm hoping it is the first of many. I love your bracelet! I had no idea that seed-beads could make a bezel that looks so effortless and organic. 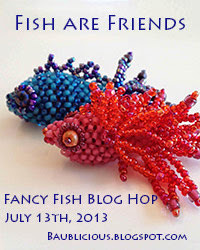 What a great subject for a blog hop. So inspirational that with such in-depth tutorials, I am thinking of having a go myself now! Karen I love the way your bracelet came out. Such a nice rhythm to the color and the beads. I love the way you integrated the button loop into the body of the bracelet and that the thickness of the cuff matches the cab. I am certainly going to try your method of making the button loop. It is always a stumbling block for me. 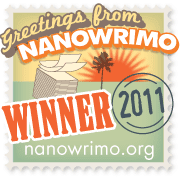 Thanks so much for setting up this blog hop and for all the helpful instruction along the way. I has been a very fine experience. Karen, the final result is beautiful - particularly the partial bezel to stabilize the focal. The colors are great, with a perfect balance of the blues and the browns. Just yummy! Thanks a million for cooking this challenge up with Mandi. I needed a creative kick in the rear, and you've hooked a lot of people on freeform. Gorgeous bracelet, made with all my favorite colors. Thanks so much for hosting this really fun challenge. I wasn't on the list but I did sign up, please take a look at what I created. And thank you so much for showing us all steps it took to create this bracelet! And of course huge thanks to you and Mandi for the challenge. I really enjoyed it. Beautiful Karen I love the end results. Which I have made up my mind to finish the one I started I really think it will be beautiful when I am finished. Thank you so much for co hosting this Freeform peyote adventure with Mandy, I have learned so much. I think this bracelet is amazing. 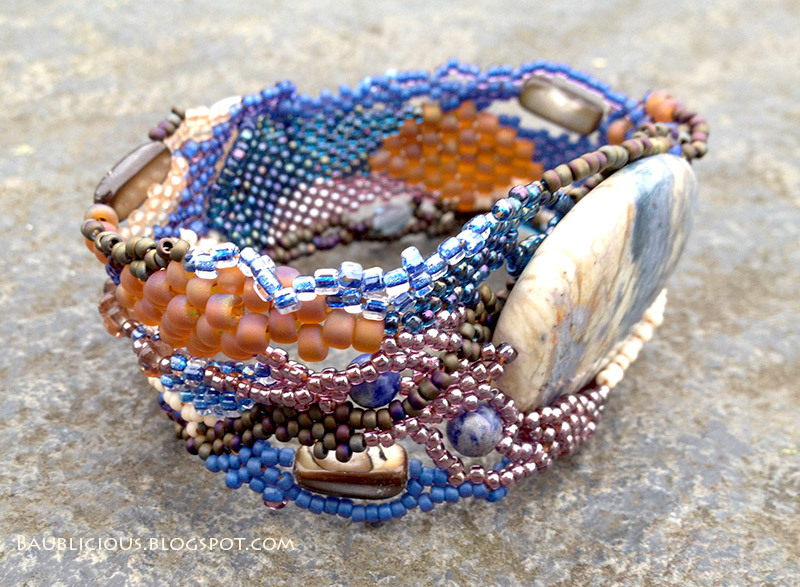 I really like the subtle, earthy feeling that comes from the palette, and I love the way you captured the focal bead' nestled in the beadwork. Lovely! It. is neat to see how you attached the stone piece..and again thanks for setting up the challenge and giving so much help with the process. Thanks for your step by step photos, it really helps. love your focal and how it's held in place. 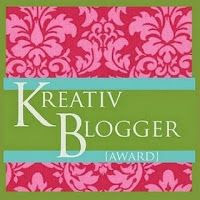 Thank you so much to you and Mandi for running this blog hop, it was a great experience. Everyone is so talented. Gorgeous! LOVE the way you've led the beadwork over your focal; I love browns, but seldom work with them for some reason. I just buy them LOL...I'll have to work them in with something like this and see if it feels better for me.